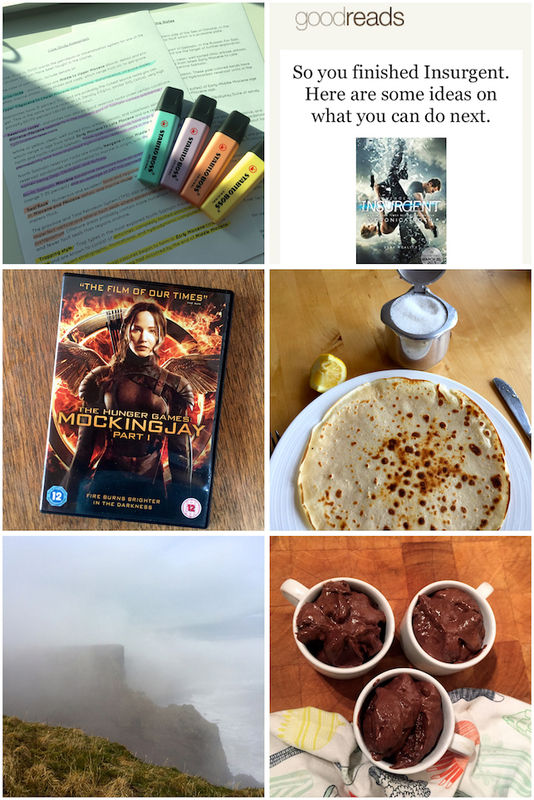 (from top left) I bought some new pastel highlighters to help me write my essay this week. I finished reading Insurgent on Friday and really enjoyed the sequel to Divergent. Mum and I finally sat down to watch the end of the Hunger Games on Saturday night. Woke up on Sunday morning with a craving for pancakes. The cliffs were covered in mist when we went for a walk. Dark chocolate puddings for a mothers day treat. I was determined to make this week better than last week so I was at the library bright and early on Monday morning to start working on my essay. For the rest of the week I basically spent all my time between the library, lectures and the gym. On Wednesday the sun made an appearance and I was able to get some laundry done (adulating is so boring but so necessary) and Scott came over for tea. We made fajitas together while I rushing around doing lots of other little jobs. After making good progress with my essay and getting on top of housework it was finally time to head home for the weekend on Friday. I stayed at my boyfriends on Friday night and we made salmon wellington. In the rain on Saturday morning I got home to see my parents for the weekend. We had a pretty lazy day on Saturday in front of the fire. We watched the rugby and I did some scrapbooking. Then after dinner my mum and I watched The Mockingjay part 1. Sunday has been pretty chilled too - I've got some outfit pictures taken and mum and I went on a walk with the dogs. We've also watched a lot of crufts this weekend which I've loved. So that's been my week and it was definitely better than last week. This coming week is going to be busy, finishing my essay and the ball on Friday. My birthday is only ten days away too!